I also love the reaction I get when I deliver the finished piece. The joy on the faces of owners when (if I’ve done a good job!) they recognise the spirit of their beloved animal in the painting. 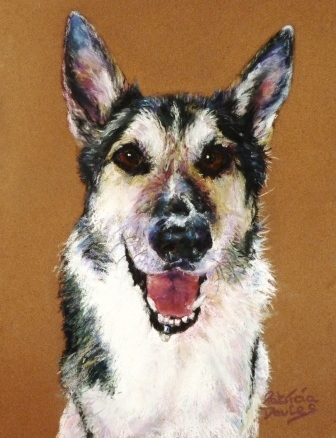 Requests for commissions are generally for dogs but I like to paint any animal, other popular enquiries have been for cats and horses, I do particularly enjoy painting racehorses .Although for horses I will generally use watercolour. My style is loose/artistic. I take lots of photographs to work from but do not copy these slavishly. 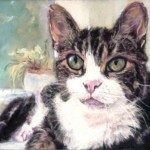 My aim is to produce a painting of the character and not a copy of a photograph. For instance I will use colours in the painting not apparent in a photograph. 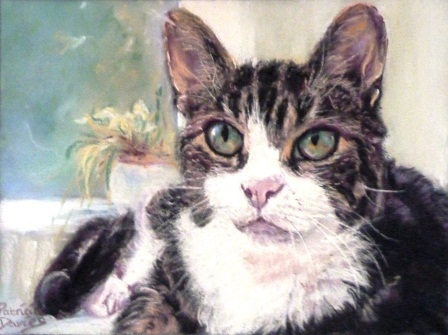 I paint in a variety of medium including watercolour, oils and acrylics but for pet portraits I usually use pastels having said that my recent larger pieces have been very well received in watercolour. 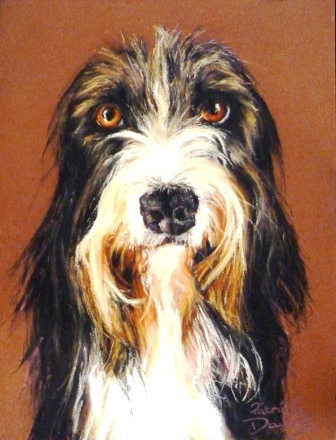 .Pastels are excellant for portraying soft fur and texture in an animal’s coat and because when using pastel you are using the pure pigment directly onto the support which gives a depth and richness, combined with texture hard to achieve in other medium for this particular subject matter. I like to use the very best materials in my work so I choose to use Sennelier and Unison pastels for the painting .Pastels make for superb materials for the artist. 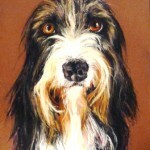 They have a vibrancy and immediacy that is a sheer delight to work with. Artists pigment in all the glorious colours available to us is all the same product whether it be carried by linseed oil,water, acrylic resin or in the case of pastel, purest powder form. 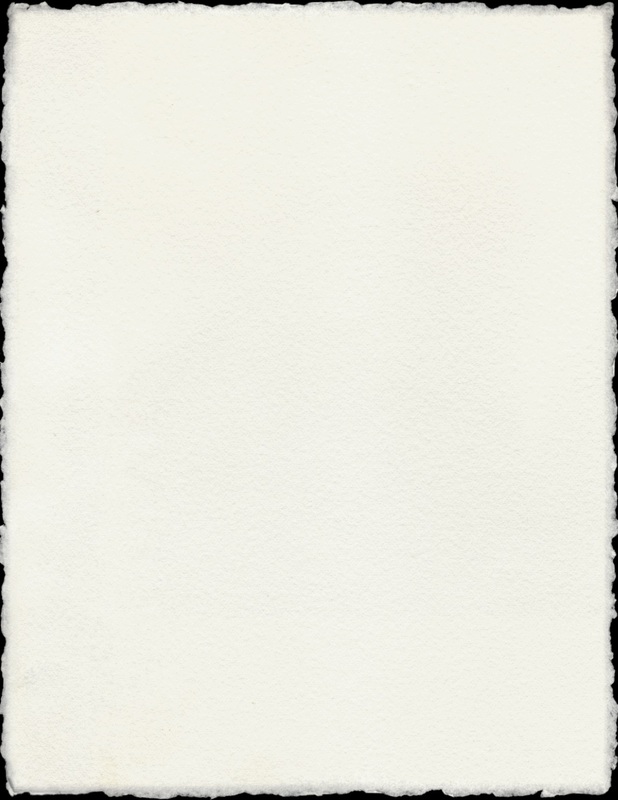 These days there is very little chalk in pastel contrary to popular belief. Of course, probably the most famous pastel painter was Degas, producing those exquisite ballet dancers. But many other artists also championed pastel such as Renoir, Whistler and Toulouse- Lautrec. 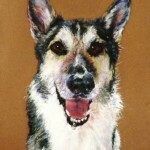 Although I paint other subjects in other medium, painting animals in pastels has to be one of the best things I do! The finished painting is presented in a high quality wooden frame in a hue to compliment the painting supplied and framed by a highly qualified and experienced framer. It is also complimented with an acid free double mount. Our friends are not with us for long and it is lovely to have a special keepsake as a reminder of what they gave to us in the short time they were here. Something special that a photogragh can never convey.